Every year, floods kill more people than tornadoes and lightning combined. They can also inflict serious damage to homes and businesses, destroying walls, ceilings, floors, and other furnishings. When water makes contact with the drywall in your walls and ceilings, it can cause them to bulge and become discolored and it might weaken the material until your walls collapse and fall apart. It’s time to assess the water damage and repair it as soon as you can. The longer you wait, the more likely you are to have severe damage to your home. Plus, mold starts to grow after 24 hours–you don’t have time to wait. As long as you have the right know-how, you can do water repairs yourself. Learn how to do DIY water damage repair with this step-by-step guide. With the right tools, you can tackle the water damage repair work yourself. If you find yourself faced with light to moderate water damage, you don’t have to call in the professionals right away. With the right tools, you can tackle the repair work yourself. Here’s how you can do it. First, make sure that the power to any outlets has been shut off at the circuit breaker. Then it’s time to look for the source of the leak. Sometimes it will be pretty obvious–ceilings might sag or walls will be dripping water. You also might notice drywall sagging or crumbling. Other times, you might only notice smaller signs, like coffee-colored stains expanding over time. It won’t always be easy to locate the exact source. Whether it’s a leaky roof or a broken pipe, water often travels further from where it originates. This means you’ll have to do some exploration. At this point, you can assess the severity of the damage to determine whether or not you need professional help. You can also check your insurance to see if you can file a claim. If there’s a large amount of black mold, severe damage to your home, or you can’t find the source of the water, it’s best to call in a professional. Now it’s time to get rid of any moisture in your home as soon as possible. Even if your walls are just damp, mold can still grow over the next few days. For smaller leaks, drying out the area is as simple as opening a few windows and using fans to circulate the air. If it’s a very small leak, something like a hairdryer will work. For more serious damage, consider renting a large dehumidifier to make sure you thoroughly dry out the room. Bigger leaks can affect wood, carpet, and other materials besides the drywall–and you don’t want any moisture left behind. Cleaning up after a flood or other water damage is a lot of work, but in some cases you can do it on your own. Before you start, lay down a tarp to catch any drywall dust and debris. Be sure to wear safety goggles, gloves, and a dust mask for your protection. Then examine the drywall to see how much damage has been done. It’s easiest to remove an entire drywall panel, but if only part of the panel is stained, you might be able to repair it by just cutting out the damaged portion. Using a utility knife or keyhole saw, carefully cut around the rotted and damaged drywall. Try to cut in a square or rectangular shape–this will make it easier to replace later. You can remove the drywall by hand or pry it out with a hammer or wrecking bar. First, measure the square or rectangular area of the wall or ceiling that you cut out from the previous step. With those dimensions, cut out a replacement piece of drywall. Make sure to go a few inches larger than the hole. Then, place the drywall up against the hole and trim to size with a utility knife. Apply a thin layer of joint compound around the hole, and then place your patch inside. Using a putty knife, press the compound down into the wall. After it’s dried, sand lightly with fine-grit sandpaper, then apply one more layer of compound. If the hole is larger than 6 inches, your patch might need more support. In this case, drill two small holes through the replacement drywall. Tie a piece of string through these holes and tie them to a stick. This stick should be kept on the front side–it’s a temporary way to steady the drywall while it dries. Once you’ve placed the patch in the hole with the adhesive, twist the stick to apply pressure to the rear of the board. When the adhesive grips the patch, keep turning the stick clockwise to increase pressure. This will hold the board in place while the compound dries. Now it’s time to put on the finishing touches. This is a good chance to seal and caulk your new materials to help reduce the chance of future water damage. Apply a primer to the new material, followed by a paint or stain. If you’re having trouble matching the color of your wall, you might have to repaint everything. If needed, apply a second layer after the first has dried. 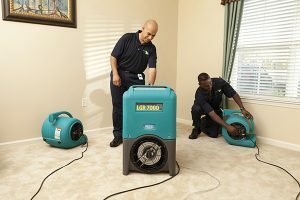 Cleaning up after a flood or other water damage is a lot of work. You can easily tackle minor water repair yourself, but the cost of your supplies and time can stack up quickly. Looking for professional help? 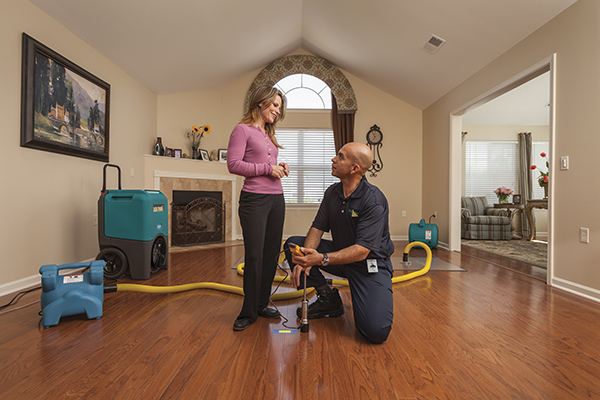 Our water damage restoration services can help make your home or business as good as new.